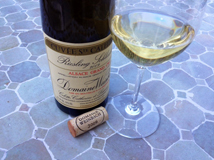 It was with heavy heart that I heard this week of the untimely death of Laurence Faller of Domaine Weinbach. She had a heart attack on Monday at just 47 years old. I had the pleasure to meet Laurence on a couple of occasions, and she was just lovely - as vibrant, beautiful and full of vitality as the delicious wines that carry her name. A couple of years ago, I tasted across the range with Laurence's sister Catherine, who has of late been the more public face of Weinbach. Undoubtedly Domaine Weinbach is one of the top four producers in Alsace, and depending on the particular wine, mood or food, the very best. My greatest condolences to Catherine, their mother Colette, and the whole family. Tonight I decided to open one of the wines to raise a toast to Laurence. I often get asked what my favourite wine is, and it is - mercifully - an impossible question to answer. If there was one favourite wine, then there would simply not be a point in tasting further. The real joy of wine is in its diversity. There are too many variables - the food, the company, even the weather all make a difference. However, if I really, really had to choose, then Alsace Riesling would be pretty high up the list for me. Dry without being searingly so, crisp without being over sharp, fruity without being too pungent, Alsace, for me, captures everything that is great about Riesling, probably the greatest white grape variety of all. There cannot be many better examples than a Grand Cru made by the inestimable talents at Weinbach. This wine has lime and elderflower, but with subtle other fruit flavours and no sharp edges. Every sip tastes slightly different, and makes you want to sip again (for me the ultimate arbiter of quality). It finishes with balanced and harmonious flavours and textures of fruit and minerals. These wines from tiny, difficult to work steep vineyards with painfully low yields and no-expense-spared winemaking will never be cheap, but they seem to offer incredible value nevertheless. Delicious, and a fitting legacy to Laurence.